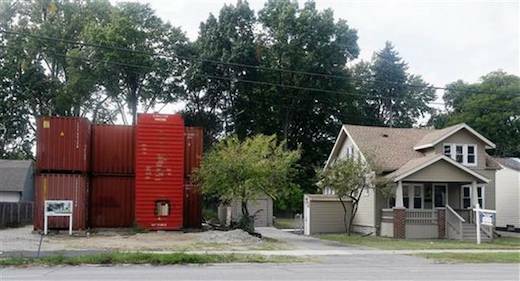 A shipping container home is going up in Royal Oak, Michigan. 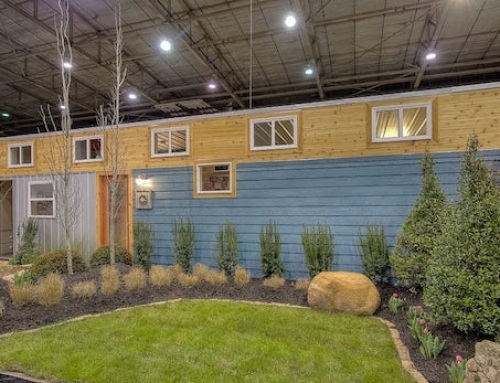 According to the builder, ModEco Development, this is likely the first home made of recycled shipping containers in Michigan. Passersby are showing great interest in the home, some even taking pictures, and so far the community support for the project seems to be a given. 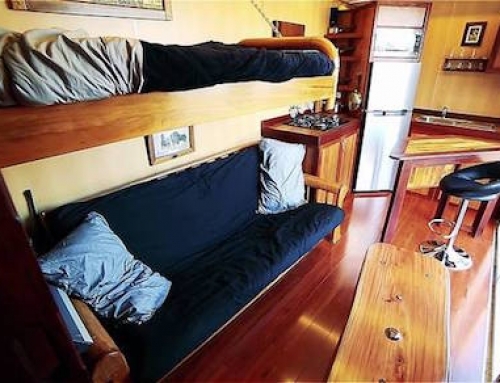 The home will be built out of seven disused shipping containers, which will make up the 2,100 square-foot home. The finished home will have 3 bedrooms, and 2.5 bathrooms. The shipping containers have already been installed on-site, and the next step will be cutting the holes for windows, doors and passageways, before the plumbing, and electrical work begins. Judging by the pictures very little work has been done on the containers prior to installing them on concrete slabs at the building site. This seems contrary to the conventional way of building larger shipping container homes, which is usually done by pre-cutting all the containers off-site, before transporting them to the building site. 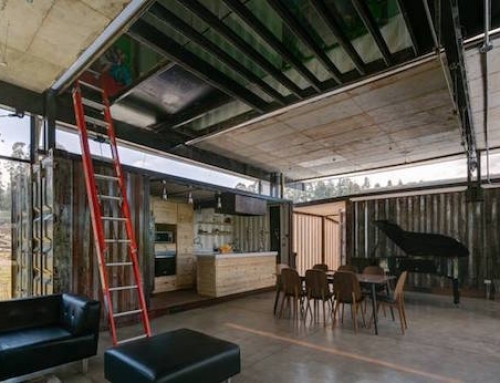 Most of the shipping containers used have been stacked one on top of the other horizontally, while some will also be placed vertically to create this 2-story family home. 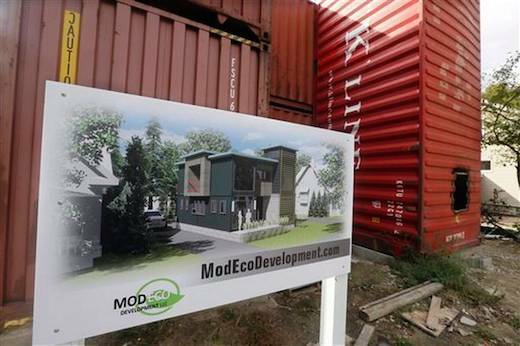 ModEco Development specializes in upcycling shipping containers into modern, light-filled and affordable homes, which nevertheless show off their industrial origins. Judging by the sketches of what the finished home will look like, this will also be the case with this home. The top floor, which will presumably house the bedrooms, will be fitted with floor-to-ceiling windows, which will replace the shorter, outward facing sides of the shipping containers. The ground floor will be fitted with large glass doors as well, which will let in plenty of natural daylight and provide excellent ventilation. 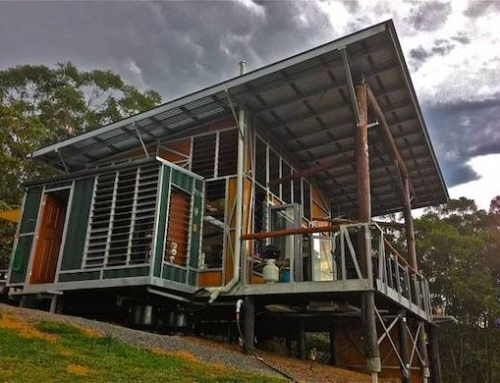 The exterior of the home will be left in its original state and painted a dark green, likely to show off the fact that the home is built using shipping containers. ModEco Development is planning to finish the home and put in on the market in early 2015. 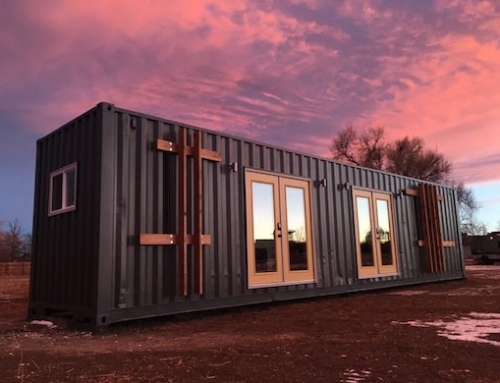 They have not yet determined the price for it, stating that the concept of building a home out of shipping containers has not yet been tested in this market. It won’t be Michigan’s first, as there are plenty in the state. Might be the first in that town. Here’s one that is/was for sale in Michigan that combined stick build. By the way, I’ll keep you posted on mine. We are about to submit the plans to the city. Can you keep me posted? Will you have a blog showing all the steps you have to go through from submitting the plan to completion? If you can send me more info, that would be great! We are SC craftsman Inc.we are building a 4000 sq ft. shipping container in fl. started 6 weeks ago should be done by end Feb. We are using 7 containers . more pictures as we progress. Where in Florida – building cost?